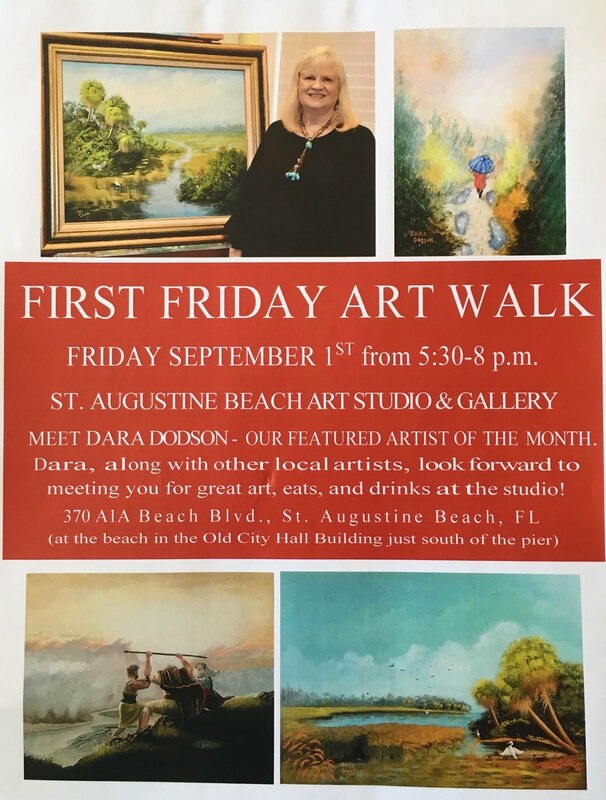 On the First Friday of each month in St. Augustine, there is an Art Walk held throughout the city. 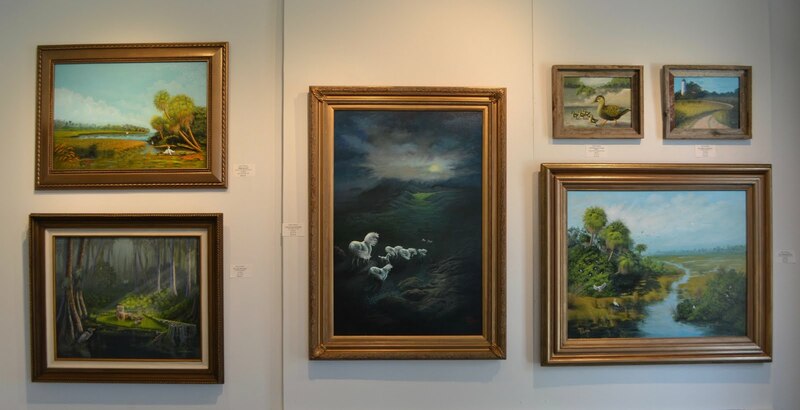 Most of the Art galleries participate, including both art associations. THE ST. AUGUSTINE BEACH ART STUDIO AND GALLERY, (they recently changed their name) is small, but has over 120 members, both professional and amateur artists. 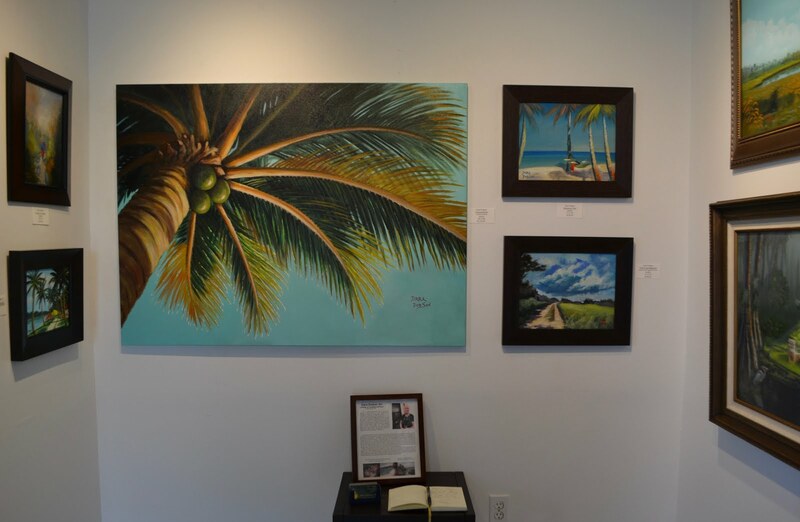 Each month someone is the featured artist. That artist is given three walls to show their work, and it is the first thing one sees when entering the gallery. The area is very nice, approximately 15ft of wall space, and I have the privilege of being September's featured artist! The area set aside for "featured artists" is the first to be seen when entering and consists of three walls, totaling approximately 15 feet. I have 14 paintings in the show and they are all consistent in color if not in content. They were grouped according to content. One wall with landscapes, one with my "Looking Up" series that is directly in the viewers eye as they enter and the last with my smaller paintings. Those cannot be seen immediately, so they invite the viewer to come over and browse! This honor has responsibilities that go along with it, of course, but it is well worth the effort! 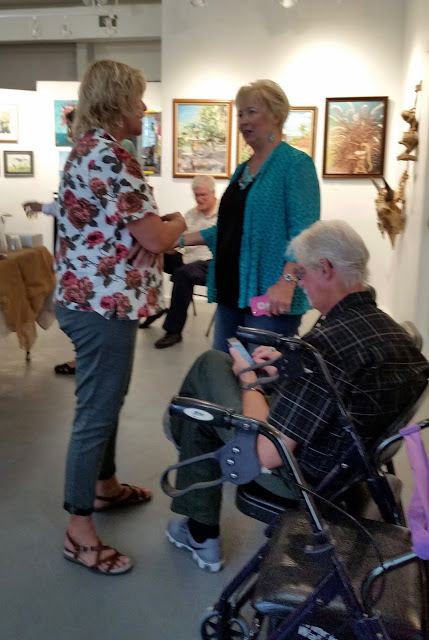 THE ART STUDIO (TAS) puts on quite a spread of refreshments for it's guests during the Art Walk, the best in town we feel, and the featured artist must provide some wine, a main dish, and a dessert to ensure there is enough food for his/her guests. No problem there. We must also be there from 5:30 to 8 pm to mix and mingle and answer any questions. Again, no problem. I thoroughly enjoyed my time and met many new people. I will certainly get my name on the list to show as featured artist again as soon as I can! There were quite a few that showed up to see all the art. 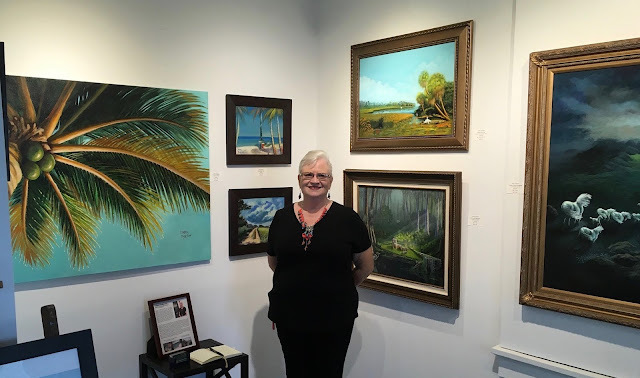 Because it is a smaller Art Association, we change out artwork every other month and September is that month, which usually means a bigger turnout of visitors and I like that. I invited the gentleman who is head of Community Education, and he forwarded my invitation to all the members of the Cultural Council and Community Education. That totaled 17 people, and when you add in all of those I invited, we had quite the turnout! I have a few photos of the walls and the crowd for you to see and enjoy. If you ever get to St. Augustine, please stop by and take a look at what we have to offer while you are visiting our beautiful beach! It is open Mon. - Fri. 12 - 4 pm and weekends by appt. Almost all artwork is for sale and there is a nice variety, including paintings, leaded glass, jewelry and pottery! Enjoy all the photos and Thanks for looking! This is the flyer they produced. It came out very nice! These are the paintings directly in front of you as you enter. You can see here that it is a U-shaped area. These are the paintings on the left wall as you come in. 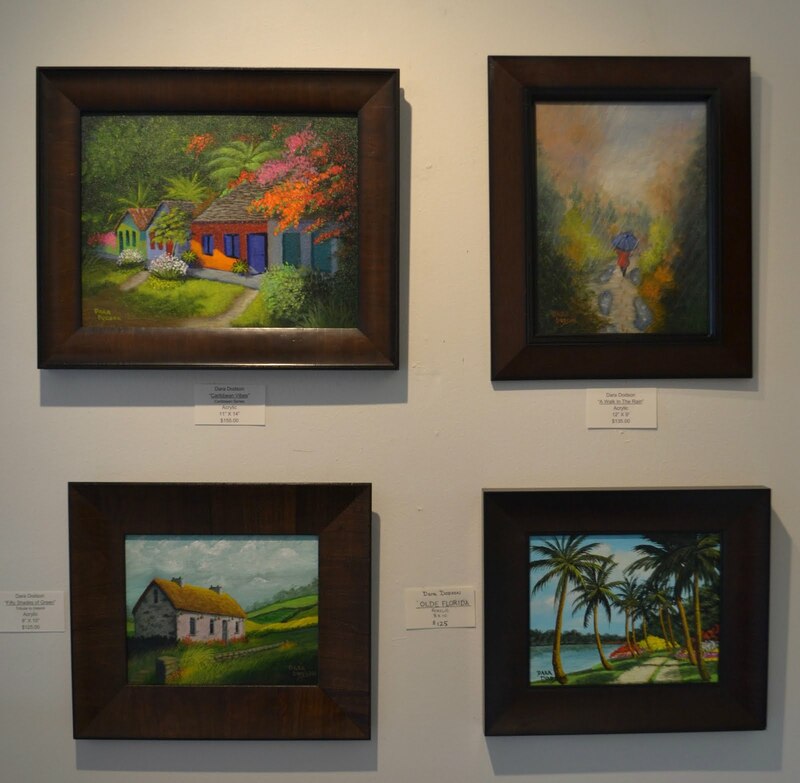 I have a total of 14 paintings on display. The main area of the Art Studio/Gallery is behind this short wall as you can see in the next photo. This is the view standing in the back looking toward the entrance. (The black rug is by the door) The painting in the black frame to the left of the floor easel is also mine. It is in the main display area. When the crowd gathers you have a hard time seeing the walls, so I took advantage of the opportunity to take these photos early! I don't normally like to post photos of myself, my husband made me this time! LOL!! When these photos were taken, it was still early. Later it got so busy that I was unable to take any more. We had over 100 people come, that's a great turnout for a location that's not on the main strip. But we always have the best refreshments in town, and once again we lived up to our claims. Some people actually eat their dinner here during the Art Walk! We had a great time and THANK YOU to all who turned out to support me! !